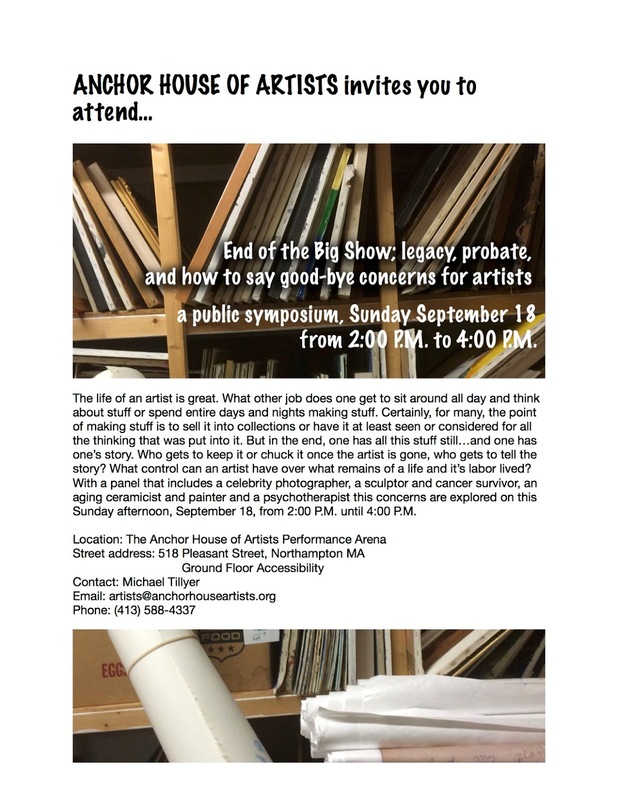 Sunday, September 18, 2:00 P.M. to 4:00 P.M., the Anchor House of Artists will host a symposium on the end-of-life concerns for artists; legacy, probate and emotional reckoning. Are these different for artists than people of other trades. Should all the stuff of a studio career be saved? By who? Who gets to tell the story after the artist is gone. A panel including a celebrity photographer, a sculptor cancer survivor, an octogenarian ceramicist, and an expressive therapist will take up the discussion with the audience. The current work in the gallery is by three artists, John Landino, Michael Tillyer and Ben Westbrock, joining in reunion from at time thirty years ago when they were each represented at the WAVE gallery in New Haven Connecticut. This exhibit is up until September 23. PLEASE FEEL FREE TO FORWARD THIS EMAIL TO PARTIES YOU THINK MAY HAVE INTEREST. This is sent by blind copy to over eighty-five parties who have expressed interest in the Anchor House of Artists. Certainly, if you are not one of these and wish not to receive emails from this address in the future, please notify this sender and your name will be removed from our list.